Placerville, California (January 16, 2019).........The NOS Energy Drink USAC National Midgets' first ever appearance at California's Placerville Speedway will pay the richest two-day purse in the history of the series with over $100,000 on the line when the series arrives at the quarter-mile dirt oval for two consecutive nights on November 19-20. The inaugural Elk Grove Ford "Hangtown 100" featuring both the USAC National and Light Up the World Western States Midgets kicks off on Tuesday, November 19 and concludes on Wednesday, November 20 with a 100-lap feature, the first 100-lap race for the series since 2012. "Midget racing is my true love," Elk Grove Ford's Matt Wood said. "I'm so excited to partner with Scott and Kami Arnold with Placerville Speedway, Mike Larson, and the entire USAC team to put on this event. The support even prior to this announcement has been unbelievable." The "Hangtown 100" is one of nine new events that have been established on USAC's calendar this season. With the largest USAC National Midget schedule in over two decades, more big-paying races and the most different winning drivers seen in a season in several years, what better time to add an event of this caliber to the 2019 slate. "USAC Midget racing is as thrilling right now as it's ever been and a huge event such as this just adds to that excitement," USAC Series Coordinator Levi Jones said. "It's an honor for us to be involved in this race and to bring another major USAC event to the west." The format for the event emphasizes passing using a modified Trophy Cup format which will use a pill draw and a "draft," similar to the one utilized during December's "Junior Knepper 55" in Du Quoin, Ill. allowing drivers to choose their own starting sports for the heat races. Drivers will group qualify based on where they will line up in their heat race. The Tuesday, November 19 feature event will be 30 laps. 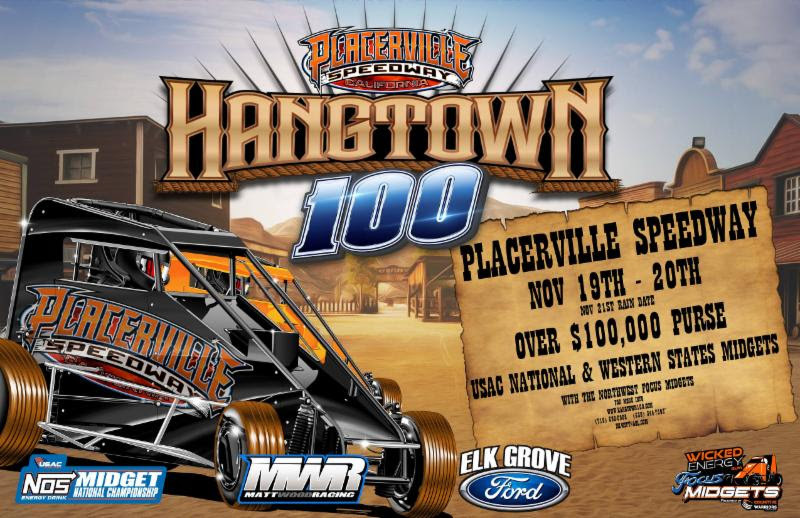 The Wednesday, November 20 "Hangtown 100" feature will pay a grand prize of $20,000 to the winner. An extra $20,000 will be up for grabs to the overall "Hangtown 100" champion who accumulates the most combined points between the two nights of racing. Both nights of racing will pay appearance points only to USAC-licensed teams and drivers toward the USAC Midget series championship standings. The rain date for the event, if needed, is Thursday, November 21. The Wicked Energy Gum Northwest Focus Midgets presented by Cognitive Warriors will also be on the event card. Drivers must be pre-registered by July 31 to qualify for a potential A-Main provisional starting spot. Pre-registration and reserved seating will be able available in the coming days at www.Hangtown100.com. USAC Midgets have visited Placerville on four previous occasions, all coming under the Western States banner. Jimmy Sills, a Placerville native, won in 1996. Ronnie Gardner captured the victory in 2016. Shane Golobic is the lone two-time Placerville winner, racing to victory lane in 2013 and in the most recent event in 2017. The "Hangtown 100" is part of an expanded western swing for the USAC NOS Energy Drink National Midgets, which concludes the season with six events in Arizona and California during the month of November, all in conjunction with the USAC Light Up the World Western States Midgets. The midgets return to the "Western World Championships" at Arizona Speedway in San Tan Valley on November 15-16 before the back-to-back nights at Placerville on November 19-20. The weekend finishes up at Bakersfield (Calif.) Speedway on the 23rd for the "November Classic," which leads into the 79th running of the "Turkey Night Grand Prix" on Thanksgiving night, November 28 at Ventura (Calif.) Raceway. Eureka, CA (January 14, 2019) – Northern California race fans can breathe a little easier tonight as there is a tentative schedule has been released for the 2019 season. In addition, news of the new promoter(s) was detailed as well as a new director of competition. Nine potential race dates are on the docket for 2019. The year is set to start off on April 27 and end on September 21. Tentative dates from the North State Modified Series have been made as well with the series potentially visiting RAR three times this season. None of the dates are on back-to-back weekends. It has also been determined that the Redwood Acres fair board will serve as the track’s promoter at least through 2019. Also of note are the race dates for each division at the Acres. Dates for each division will be determined in the near future. It is possible that divisions will not race the full schedule but decisions regarding that will be forthcoming in rules meetings for each division. A “competition committee” will be created for each division. Drivers in each class will vote to have two to three drivers represent the class. Those drivers will then talk to officials for any issues or problems that may arise during the season. Former RAR driver Jaison Chand has been named as the director of competition, the highest ranking official. As mentioned, the final schedule and rules for each division will be determined in upcoming meetings at the fairgrounds. 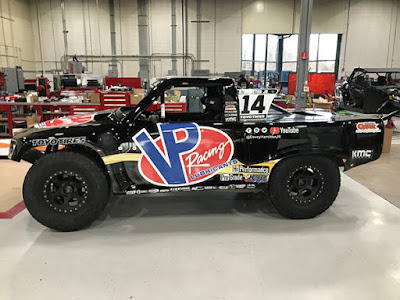 INDIANAPOLIS, INDIANA (January 14, 2019) – Davey Hamilton, Jr. will kick off his 2019 international racing campaign this weekend during the Race of Champions at Foro Sol Stadium in Mexico City. 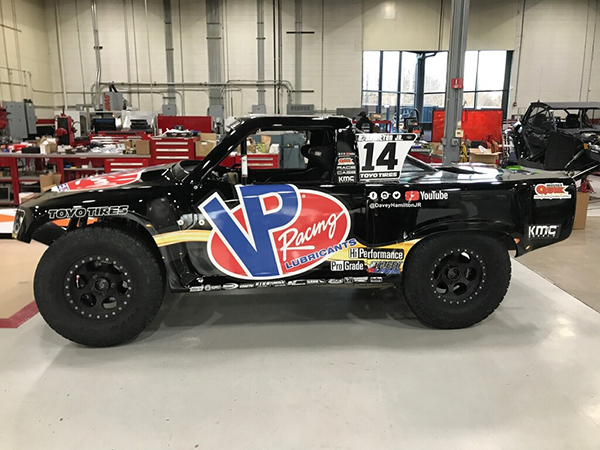 Hamilton will be competing alongside nine other competitors in Stadium Super Trucks, with head-to-head races supporting the Race of Champions. The Foro Sol Stadium is located within the Autodromo Hermanos Rodriguez Formula One circuit. INDYCAR, NASCAR, Le Mans, and Formula One champions from around the world will compete in each day’s Race of Champions, with Hamilton and the SST drivers hitting the same circuit to close the evening. A few modifications – including steel ramps – will help the 650 HP trucks reach their full potential during the exciting head-to-head shootout format. Hamilton, the 2016 King of the Wing Sprint Car Champion, is competing full-time in both Stadium Super Trucks and the USAC Silver Crown Series in 2019. He is relishing the opportunity to race outside of the United States. You can learn more about Davey Hamilton, Jr. on Facebook, Instagram, YouTube, and Twitter. A complete 2019 schedule is expected to be released soon.